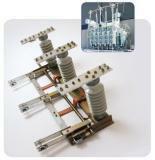 EME - ELECTRO MECHANIC EQUIPMENT, Електричество - компоненти и части, earthing switches, sectionalizer, в EUROPAGES. More and more OEM’s in the World of electrical energy are looking for special disconnectors for their projects.This need is often irregular and focused on small series or even unique pieces. That’s why EME (Electro Mechanic Equipment) organized his entire design and production equipment of MV isolators (1-52kV) in a very flexible way. We start from a modular design, based on a standard library of tested components using the most sophisticated 2D and 3D software. Thanks to a resourceful stock of elementary components and a unique ERP driven organization, we can produce diverse disconnectors to attractive prices and within moderate delivery times. We never cut down on quality, on the contrary all EME disconnectors are “old fashionedly” over dimensioned. We design your custom made disconnector together with you.